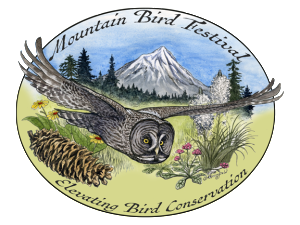 The award winning Mountain Bird Festival is back, celebrating the natural wonders of southern Oregon and northern California. The 2015 Mountain Bird Festival will be held in Ashland, Oregon from May 29th-31st. Registration for the Festival will be available on the Klamath Bird Observatory website at www.klamathbird.org. The Mountain Bird Festival offers guided bird walks, a keynote presentation, fine art galleries, local wine, microbrew, and food vendors, and a feel-good community atmosphere. Registration includes half-day or full-day field trips offered on both Saturday and Sunday. The 2015 Mountain Bird Festival combines a celebration of the Klamath-Siskiyou Bioregion’s spectacular mountain birds and the stewardship ethic needed to ensure thriving landscapes for humans and wildlife. Every citizen who participates in the Festival helps to advance bird and habitat conservation in multiple ways. They contribute to habitat protection through the purchase of a Federal Migratory Bird Hunting and Conservation Stamp (a.k.a. the Duck Stamp), thereby supporting one of the most successful conservation programs in the United States. Festival attendees also purchase a Conservation Science Stamp with proceeds supporting Klamath Bird Observatory’s regional science and education programs aimed at achieving sustainable natural resource management. Additionally, every Festival goer serves as a citizen scientist contributing field trip bird sightings to eBird Northwest, a rapidly growing database that advances our knowledge about birds and their habitats. This year’s Mountain Bird Festival features a keynote presentation by Cornell Laboratory of Ornithology’s International eBird project leader, Brian Sullivan. Brian will show us how eBird and its state of the art technologies are revolutionizing birding, making this popular recreation a powerful conservation science activity. The Klamath-Siskiyou Bioregion of southern Oregon and northern California is one of the most biologically diverse regions in the world, an absolute must-see for birders and naturalists. The 2015 Mountain Bird Festival offers guided bird walks to some of the most beautiful and diverse landscapes of the region. Field trips will target highly sought after mountain birds of the Cascade, Siskiyou, and Klamath Mountains, as well as Klamath Basin specialties. Target birds include Mountain Quail, nesting Sandhill Cranes, dancing Western and Clark’s Grebes, Black Terns, Great Gray Owls, Calliope Hummingbirds, and the bird that will be featured on this year’s Conservation Science Stamp, the White-headed Woodpecker. The Mountain Bird Festival has received national awards for becoming one of our nation’s leading conservation events. Please join us for the 2015 Mountain Bird Festival and become part of our efforts to elevate bird conservation. Click here to view a a copy of the press release announcing the 2015 Mountain Bird Festival.